The first phone call this morning was a guy wanting to know more details about the play we were hosting this afternoon. Play? You sure you're calling the right place? He was. 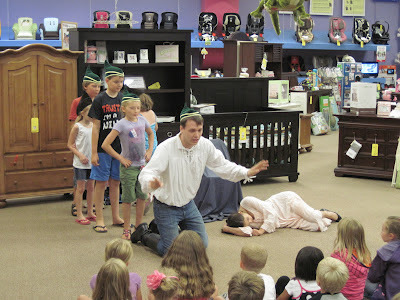 A month or so ago I had agreed to allow the Michigan Shakespeare Festival's Shakespeare for Kids program to do a performance of Snow White here at the store. I wrote it down in my calendar but forgot all about it. I never mentioned it to the staff. I never put up flyers, sent out emails, posted it on Facebook. At this point some store owners would panic. Some would fret about the missed opportunities. Some would beat themselves up over it. Some would wallow in the mistake. I went to the grocery store and stocked up on waters. I printed a few quick and simple signs. I got on Facebook. My staff posted the signs around the store, made a special display of Shakespeare books, and made a stage and seating area for the performance. Before too long, the phone was ringing off the hook. By 1pm we had a few dozen children sitting on the floor, another couple dozen adults sitting in chairs, and three fabulous actors putting on a wonderful show. The kids laughed, made bird sounds, became trees and a few even got recruited to be dwarfs. Parent after parent came up to thank us for the event. There was a line to sign our Guest Book. And the kids had a ball! Lesson? Sometimes you make mistakes. Sometimes you forget. 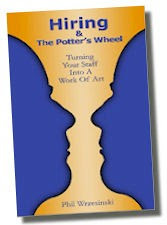 When you do, you can take two paths, one of woe or one of WOW. Yes, we might have gotten a bigger crowd if I looked at my calendar more often. More importantly, those customers who were in the crowd had an awesome time and never knew of the mistakes I had made. PS No matter what, never lament the customers that aren't there. Celebrate the ones who are and make it as special for them as you can. PPS And always look at your calendar at least a few days in advance.